The Keystone XL pipeline project of TransCanada Corp. should be halted because the US did not complete an environmental impact review before work started, green advocacy groups said in a lawsuit filed on Wednesday. The Center for Biological Diversity, Friends of the Earth and Western Nebraska Resources Council allege that the public process was a "sham" and that TransCanada has already started construction in the lawsuit filed in Omaha, Nebraska federal court. Governors of five of the six states the pipeline crosses have backed the project, except for Nebraska. TransCanada has strongly denied the claims – all it did in Nebraska was "mow some grass." Bloomberg reports the pipeline runs through north-central Nebraska’s Sand Hills region. The work is forcing the clearance of native grasses and relocation of an endangered species of whooping cranes, according to the complaint. “Like so many claims made by the professional activists who are opposing Keystone, these claims are false – no construction has taken place in Nebraska,” a TransCanada (TSE:TRP) spokesperson told the Financial Post in an emailed statement. MINING.com reported on Wednesday that the lack of pipelines may not be the greatest threat to the oil sands: Even if both Keystone XL and Enbridge’s Northern Gateway pipelines are built expensive to extract bitumen cannot compete with the many new shale oil plays – particularly in the Bakken oil basin – which have pushed US production to its highest level in a decade. 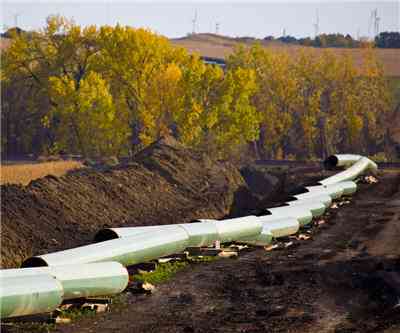 Image shows TransCanada's Keystone oil pipeline construction in North Dakota.